As you may have noticed by now, Alli does plenty of spinning, knitting and weaving. I tend to do more crochet and knitting. We both dabble in plenty of other crafty activities as well. For example: painting, drawing, carving, sewing, cooking, card-making, scrapbooking, and much more! In fact, if you come across something you think we ought to try, tell us! Maybe we can blog about it too! I am going to take some liberties here and say that Alli and I both are just naturally the artistic type. We have both been fortunate to have friends and family that support our addiction, ahem, hobbies. Plenty of what we know; however, is self-taught or was handed down by a “self-taught”. So I thought I would share with you a few of the great resources available online. 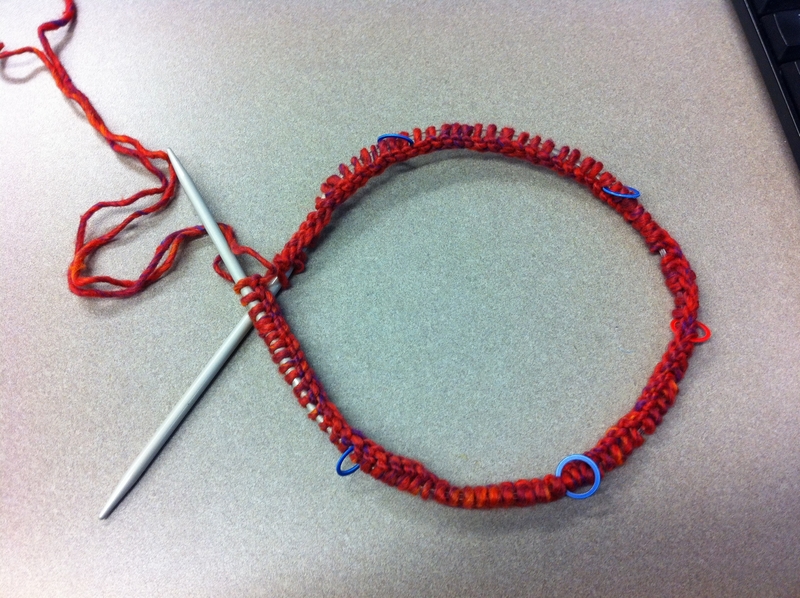 Most of what you need to know to become a skilled crocheter is available on YouTube. There are some great how-to videos out there. Some are certainly better than others. I have tracked down a few favorites for you here but if you come across something you think is better, please let us know! Also, if you don’t find what you are looking for, tell us about it and we will track it down! Thanks! Many of the authors of these videos have other instructional clips too. I have tried to find a variety so that you can choose your favourite source and explore other videos authored here. Please note that there are some interchangeable terms used in crochet depending on your source. See abbreviations above for clarification. If I had to categorize knitting and crochet into a particular season, I think winter is very fitting. 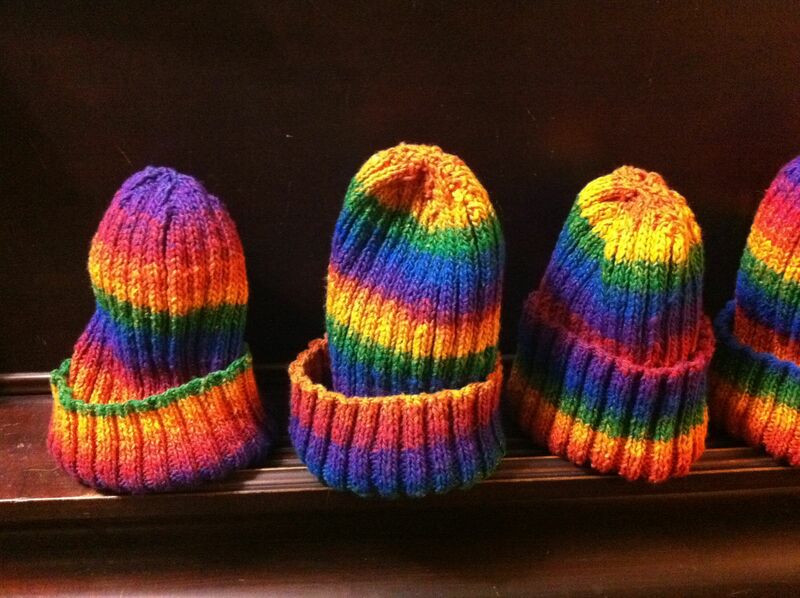 In the winter, the cooler weather and ever-changing fashions lure me back to my yarn stash. Inspiration is easy to find in stores, on celebrities and in the natural need for a fresh new pair of mittens on a cold day. 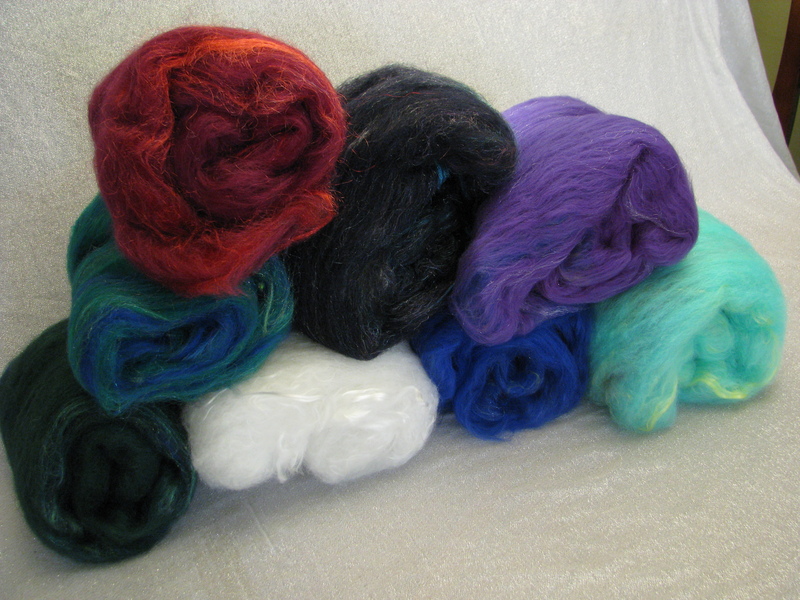 In the summer, warmer weather calls to me and, for some reason, I forget all about fiber arts. It’s certainly not for lack of projects to do. I always have a long mental list of pieces I want to accomplish. Perhaps I fall prey to the cliche that knitted and crochet garments are better suited to the cold (we all know that there are plenty of summer patterns on Ravelry). I just tend to set aside my projects with the intention of picking it back up in a day or two and, before I know it, it’s time to start Christmas gifts again. The projects that I had told myself I would accomplish once I finally had the time are put back on hold before they are begun. This year, as I feel my interests begin to once again shift, I am more determined than ever to stay focused. So, inspired by a request by my husband, I have come up with a strategy. I am going to sprinkle in a bunch of small projects with my larger ones so that I can enjoy the satisfaction of a completed piece and stay motivated to continue on the large ones. What does this have to do with you? you may wonder. Well, for one, it means that I will be blogging more often. For two, (do we say “for two”? 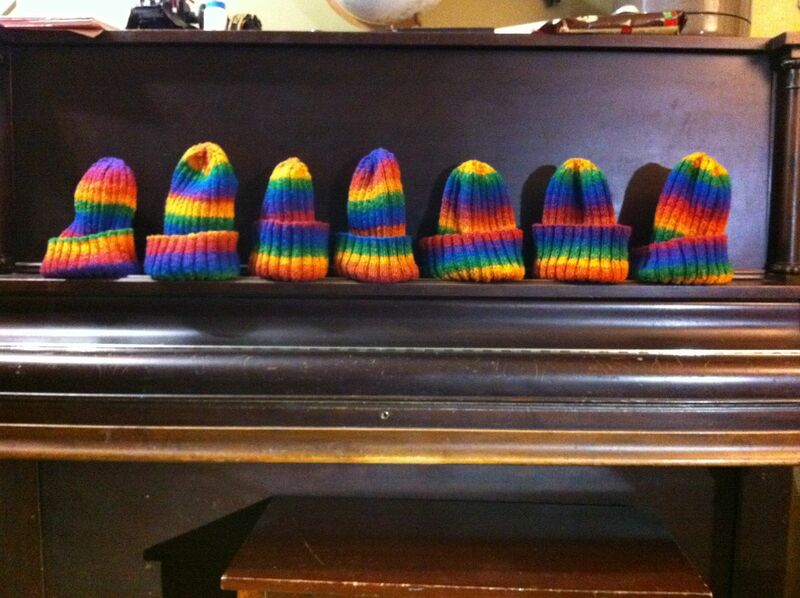 ), it means you get a free pattern for the sweet little newborn hat I made for Brian’s associate who just had a baby girl! By the way, how do you stay motivated to work on those bigger projects? Share your strategies in the comments! For this little newborn beanie, I used some leftover Bernat Alpaca in Ebony (Less than 50g) and a couple of meters of hand spun yarn made by Alli which was absolutely beautiful! 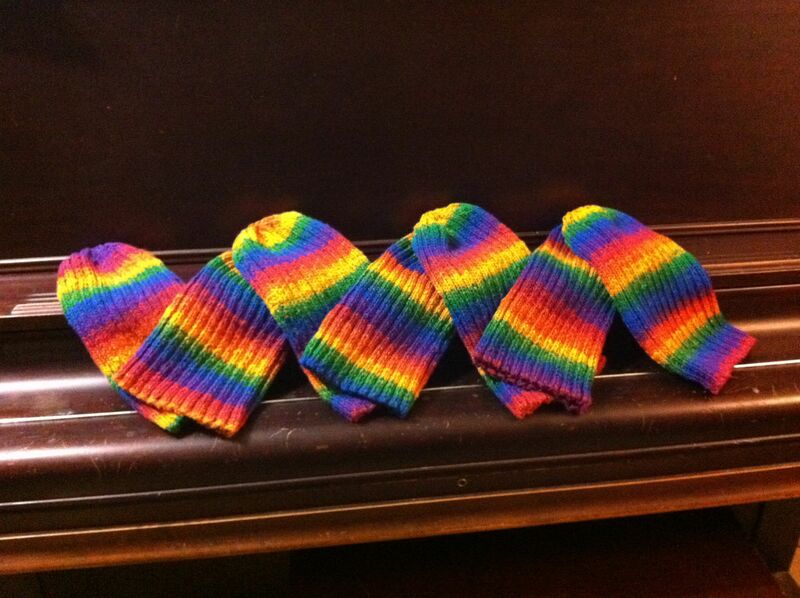 (Check out her yarns and other products here!) The pattern is super simple and the whole project took me less than an hour! 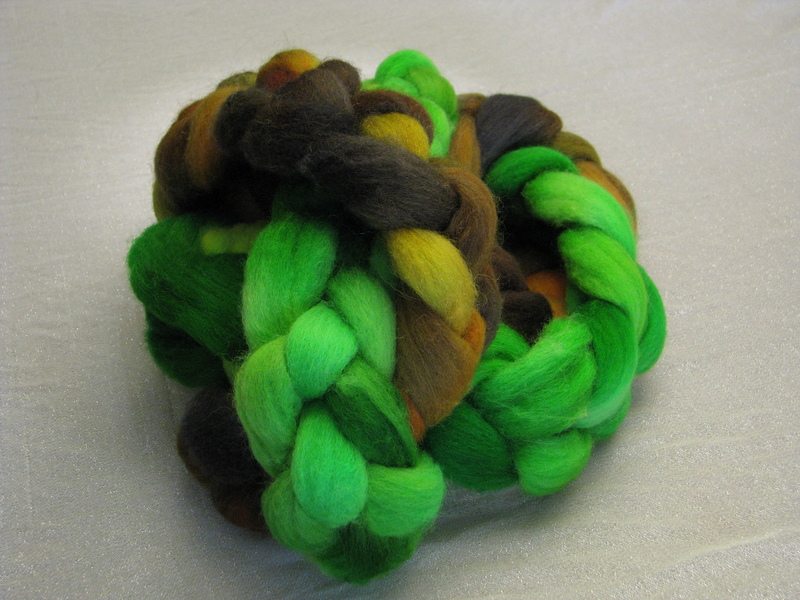 Note: If subbing for another yarn, I would recommend a DK or sport weight yarn or slightly lighter than worsted. Begin: Ch4, sl st to first chain to form a loop. Ch2, 8 hdc into loop. 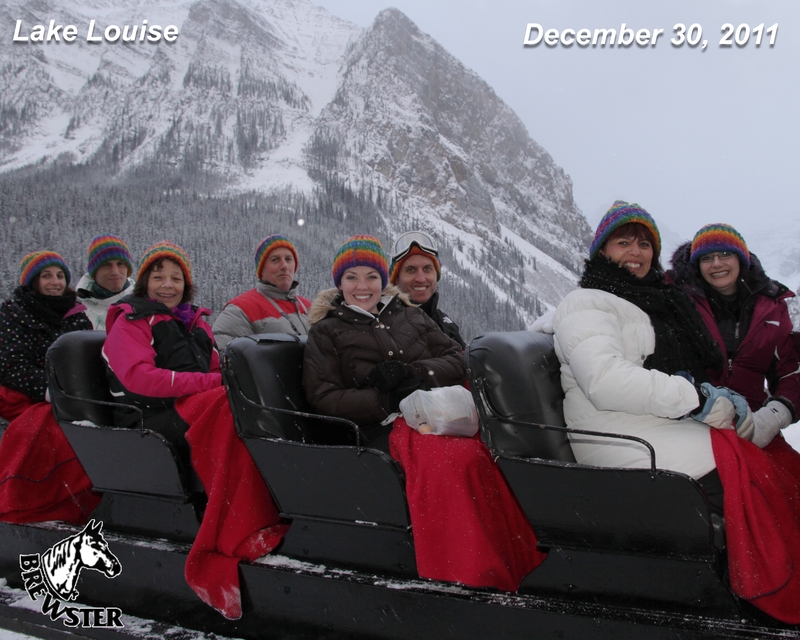 Join to first ch2 with a sl st.
Row 1: Ch2, hdc1 into first hdc, hdc2 into each rem. hdc around. Join. Row 2: Ch2, hdc1, [hdc1, hdc2] rep. around. Join. Row 3: Ch2, hdc1, [hdc1, hdc1, hdc2] rep. around. Join. Row 4: Ch2, hdc1, [hdc1, hdc1, hdc1, hdc2] rep. around. Join. Repeat row 4 seven more times. Fasten off and weave in ends. 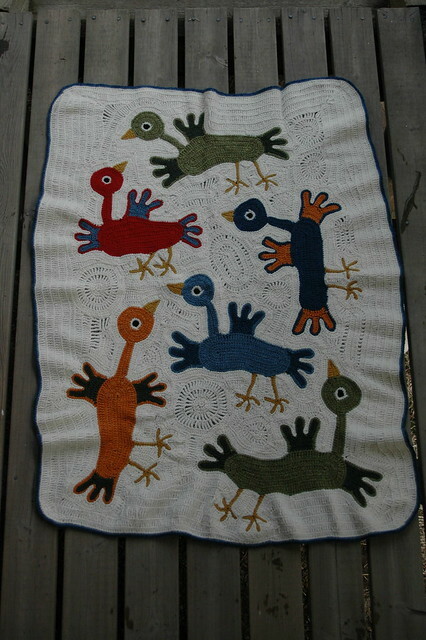 This is a great little appliqué for using up scraps of yarn. I used some of Alli’s hand spun yarn! Ch 11 (foundation chain), ch2, turn. Dc4 into 4th ch from hook, ch2, [sc, ch2, dc4, ch2], rep. until you have formed 5 petals. 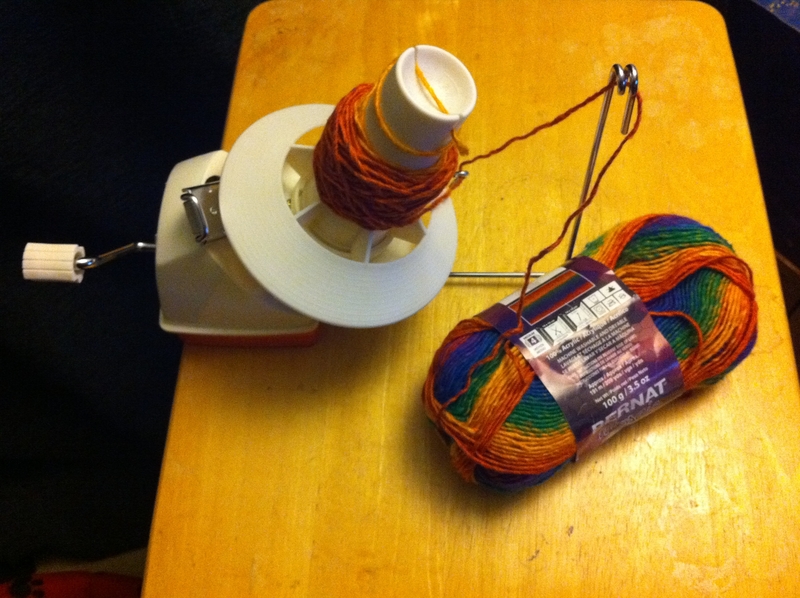 Fasten off yarn with a 5″ tail and draw tail back through the foundation. Tighten to form flower and fasten off. 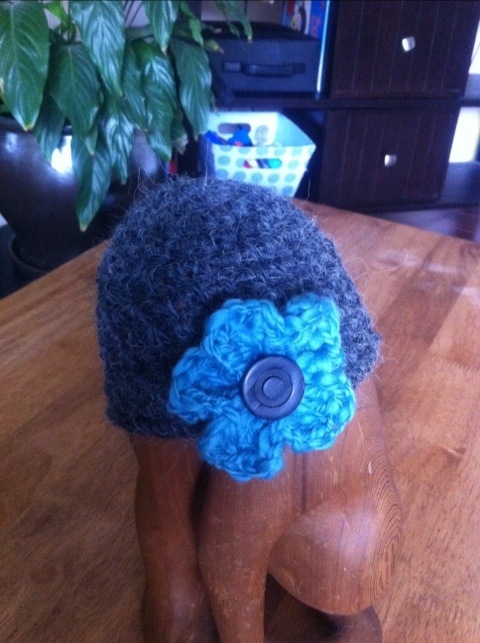 Use a large button as the centre of the flower and attach flower to the base hat. 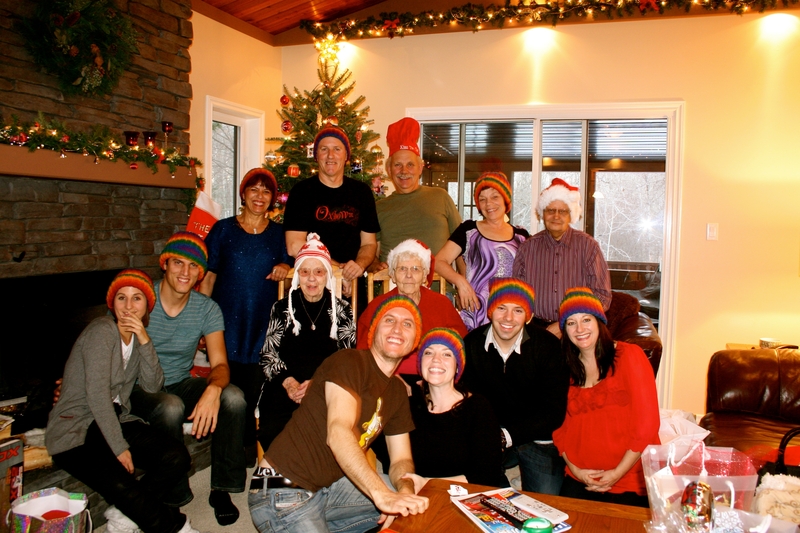 Okay, so I know it has been a very long time since I have blogged. I have a big update in the works which I should have up soon. 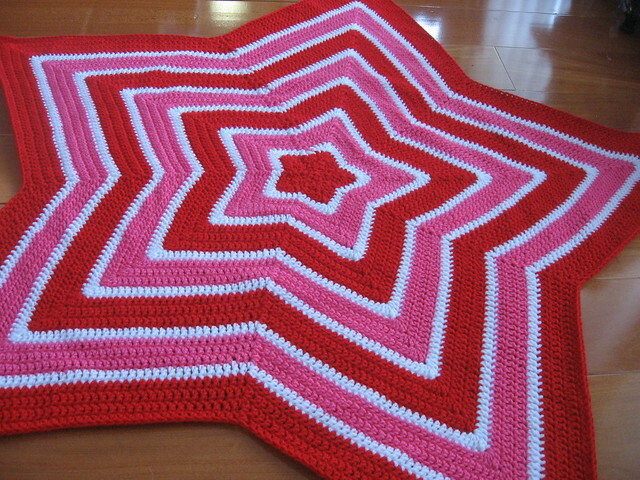 Until that is done, I wanted to share the crochet blanket I have been working on. 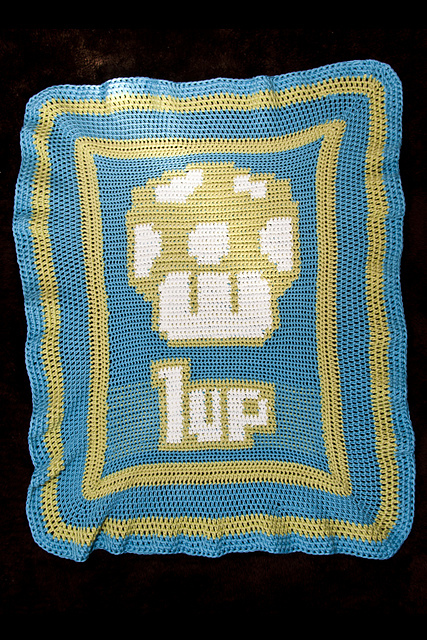 It is for my son and I didn’t use a pattern. 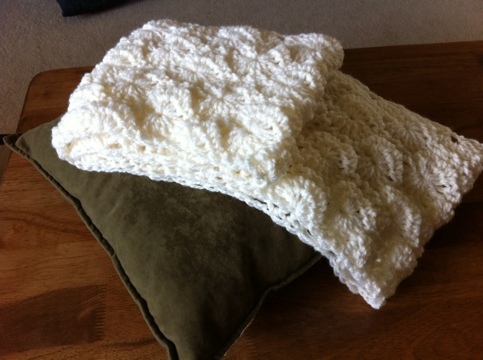 Crochet, for me, provides flexibility and the ability to improvise. I love that it is quick, (I am a sucker for instant gratification. ), and I love how portable and forgiving it can be. The drawback though is that it uses much more yarn than knitting and I often prefer the texture of a knitted garment to a crocheted one. For this project, I dug through my stash of yarns and selected a few worsted weight yarns in teal, grey, black and white. These were a combination of Red Heart, Bernat, TLC and a bag of anonymous roll ends I bought at discount from Zellers I think. The process was quite simple, very portable and fast! This project is incredibly easy to pick up and put down at a moment’s notice as well. 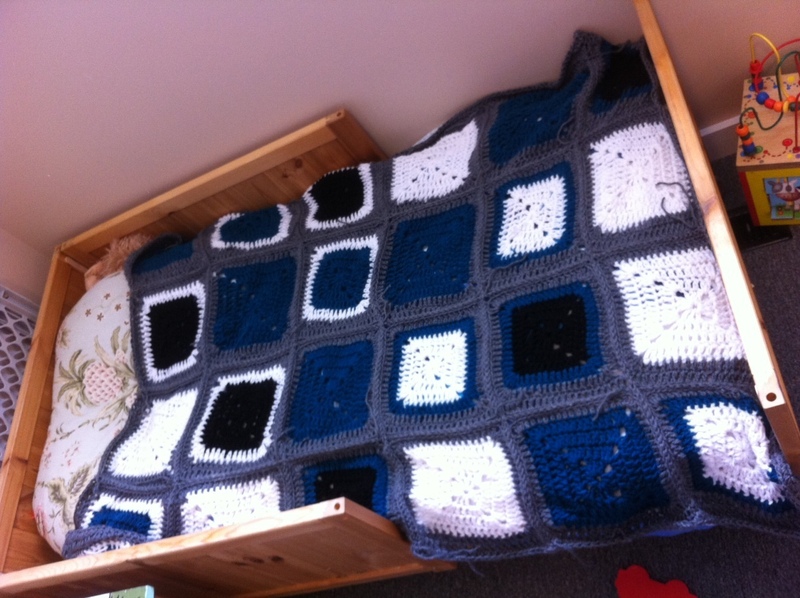 Because this blanket was for my son, the size isn’t too big; four squares by six. I wanted to create a randomized pattern with both solid and multicoloured squares so I crocheted 6 teal, 6 white, some with teal centres and black or white borders, some with white centres and black or white borders, and even a few black ones. 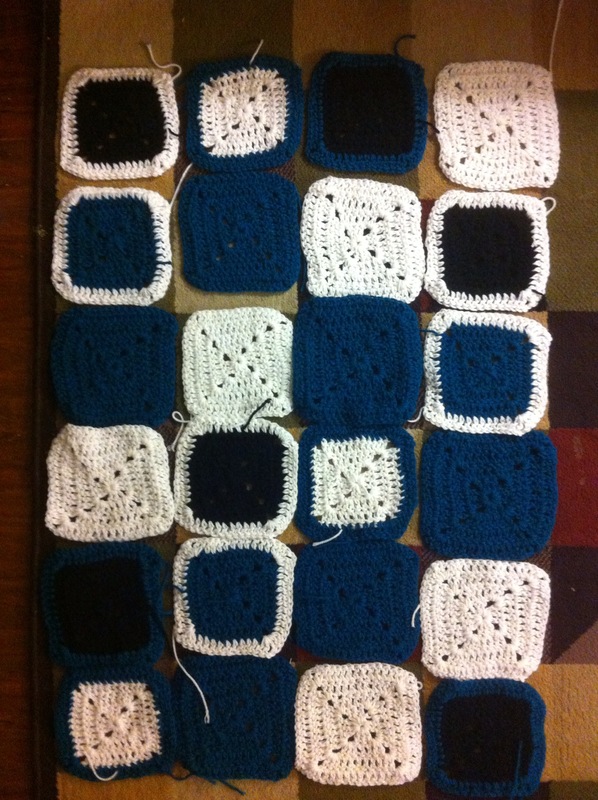 Finally, I bordered every square in grey, adding an extra row one side in the hopes of making the blanket a bit larger. To bring it all together, I used a slip stitch through one of the top loops of each square then I created a border in half double crochet. I am a very “type A” personality so I needed a bit of help from my husband and Alli to add a bit of chaos to the pattern. I really like how it turned out. I wasn’t expecting the reaction I got from my son when he saw all of the pieces finally as one. He was elated! In fact, I have not yet been able to weave in all of the yarn ends as he doesn’t want to give it up. He saw it on the floor, final product for me to appraise and immediately began to dance on it! It was very cute.